When prodded to name my favorite restaurant, I tend to equivocate. Why? There are, simply, too many criteria to appropriately answer this question, and moreover, it’s usually an opening for the person to relate his or her own recent dining experience. But if the person persists and wants to know a restaurant that’s really left a lasting impression upon me, Sonoma Restaurant has always topped a very short list. The reasons for this are simple: The chef’s flavor and textural combinations are culinary mastery accented with a bit of “dazzle,” and Sonoma has a never-flinching tradition of superior hospitality. Last summer, I was astonished to hear that Sonoma was moving to Worcester. Why would they decamp from their beautiful Princeton location and their neighbors, The Thirsty Lab wellness emporium? Would this be in name only? Were they abandoning the unique “formula” we were so fond of? The fact that they were moving to the Beechwood Hotel gave reason for hope. After all, the Beechwood – Worcester’s boutique hotel – has long been associated with fine dining in a setting that is, I daresay, the most sophisticated in town. Sonoma + Beechwood. It could be the perfect marriage. After waiting some weeks for the kitchen to iron out the inevitable challenges that beset such a change, I finally joined a friend for dinner at the relocated Sonoma. We were seated in a booth set with fine linens and minimalist appointments; salt and pepper shakers shaped like slender stalagmites, a flickering candle and a small jar with a stem of flowers. Jessica, our server, arrived with menus and filled our water glasses. Needing some time to develop a dining strategy, I requested a few minutes before specifying my drink order. In that spirit, she recited a list of the day’s specials and left us to make our decisions. The pace of an evening at Sonoma is always relaxed but never without something of interest. This evening the chef’s amuse-bouche was a small dish bearing two sweet potato latkes dabbed with a cool, creamy sauce. They were soon followed by piping-hot French bread served with creamy roast garlic purée and tapenades of green and black olives, three delicious scoops amidst a pale-green splash of fresh olive oil. Such distinct and seductive flavors were a tasty debut. For our appetizer, we chose the chef’s Charcuterie and Cheese Board. Delightful to behold, it was a nibbler’s odyssey of blue cheese, English cheddar topped with wholegrain mustard, spek ham and hard salami. That’s just a few of the eight meats and cheeses on this board. Also of note: tart quince jelly, a dab of waxy honeycomb, a cluster of raisins sun-dried on the vine and a toss of Marcona almonds. And, my favorite, a cup of absolutely luscious peach chutney. If that wasn’t a clue, our entrées proved Sonoma hasn’t skipped a beat. 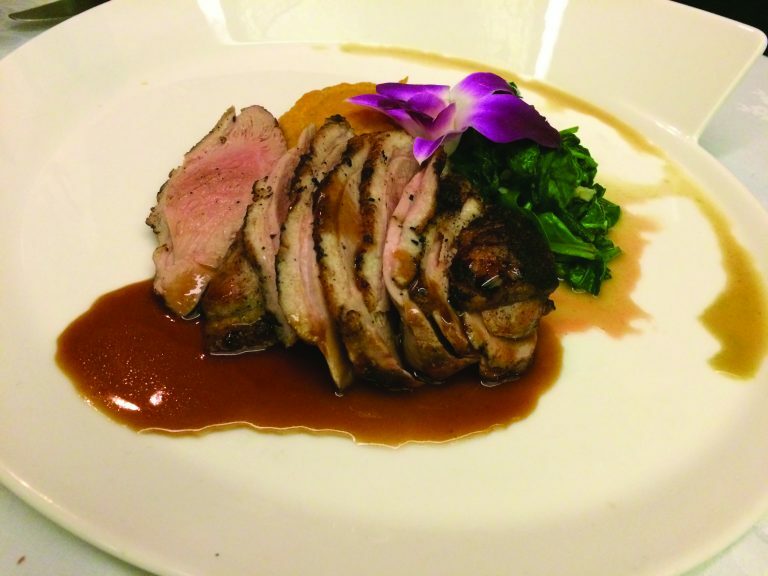 My guest’s Grilled Breast of Duckling was served over maple demi-glace aside a sauté of deep-green garlicky spinach and a purée of sweet potato. But let’s focus for a moment on the duck. The pink-centered breast had been sliced very thin. Each slice was so tender and juicy, he was able to cut it with his fork. This was a large portion, 10 or 12 slices. My entrée, one of the day’s specials, was Wild Boar. Two dramatically French-trimmed rib chops, their long bones framing an orchid flower, were nestled against impeccably steamed baby carrots, haricots verts and tender new potatoes. Not at all gamey, the boar meat was absolutely lean and mild in flavor. The real engine of “big flavor” in this dish was the hash of maple sausage and root vegetables underlying the chops; these are flavors that put the “cozy” in late fall and winter. My glass of Lincourt “Lindsay’s” Pinot Noir, with its smooth texture and cherry-plum peppery flavors, seemed an ideal match. In a continuing spirit of “research,” we allowed Jessica to wheel the dessert cart to our booth for inspection. Just skip this step if you’re seriously trying to limit calories! We split a huge wedge of homemade carrot cake, lush with moist shredded carrot, raisins and walnut chunks — all swathed in a thick blanket of cream cheese frosting. It was an outrage — one we attacked with all our remaining might. Now, a decade later and in a new venue, it’s a pleasure to report that the tradition lives on.